In the evening lavender comes into its own, the relaxing and sedative aroma of lavender has an almost immediate effect as soon as it hits the sensitive membranes inside your nose. (Duke, 138-139 ) Soaking in a lavender scented bath relaxes away mild depression and anxiety and may even lower high blood pressure and improve circulation. Lavender is approved for use by the German Commission E for use internally for insomnia, restlessness and nervous stomach irritations and for external use in baths for the treatment of functional circulatory disorders. Commission E Oil of lavender is sometimes effective in bringing back circulation to feet that have lost feeling. Regular lavender baths are can be enjoyed throughout a woman's pregnancy. ( Gladstar,36) Lavender is a wonderful sleep aid. Combine with valerian, or chamomile for a relaxing tea, diffuse in an aroma lamp for restful sleep, use it in your evening bath, sprinkle a few drops of lavender on sheets and pillowcases, and add dried lavender flowers to sleep pillow mixtures. Lavender for Skin Care: Lavender is well regarded for it's skin healing properties as well. It's effectiveness in treating burns was first discovered by French biochemist René Gattefossé when he cooled his hand in a handy vat of lavender after burning it in a lab accident. This storied burn healed so quickly, and without scarring, that it is often cited as a seminal event in the birth a modern aromatherapy. (Balch, 89) To make a all purpose remedy for scalds, burns, and sunburns: apply a cloth wet with witch hazel, then apply a few drops of lavender essential oil directly to the burn. To treat skin abrasions first clean the affected area with warm water with 5 drops of lavender diluted in a bowl. Apply one neat drop of lavender and leave to heal. Acne responds to gentle herbal oil treatments that are much lighter and less harsh than over-the-counter chemicals. Lavender skin care products are ideal for oily and combination skin. 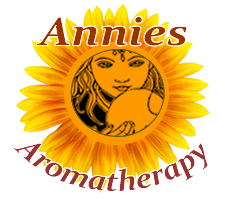 Dot essential oils of lavender, tea tree and lemon on blemishes to kill bacteria. You can also blend these essential oils with light, astringent facial oils like almond and grapeseed, or make a facial wash with lavender herbal tea. Lavender oil is an effective antiseptic. A lavender massage on the chest and lymph nodes is relaxing and helps kill germs. Lavender flower water, or a few drops of lavender essential oil make a good balancing and sweet smelling perfume. Use lavender sachet bags to protect clothes against moths. Also flies and mosquitoes dislike the fragrance, use the oil in insect sprays, or add the cut flowers to flower vases. Lavender is anti-inflammatory and antiseptic. A tea made from the fresh or dried flowers can be applied as a skin wash for both pets and people to relieve itching due to flea bites and rashes, or the essential oil can be used. 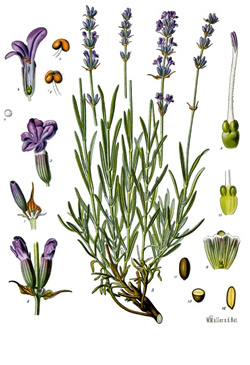 Lavender essential oil is steam distilled from the flowering tops of the plant. It is clear or pale yellow in color and has a distinct floral and herbaceous aroma that is sweet and clean. Lavender essential oil is amazing in its extensive positive benefits on mind, spirit, and body. Lavender is the first oil in any collection for aromatherapy and is one of the few essential oils that is gentle enough to apply directly on the skin. In the Kitchen: Lavender adds a unique flavor to foods, and lavender sugar can be used to decorate baked goods, but use a light hand, too much lavender can overwhelm a dish. It plays better as part of a choir of tastes, combining nicely with citrus, mint, berries, ginger, figs and vanilla, or other strong Mediterranean herbs such as marjoram, oregano and fennel. Lavender is a small shrub that grows 2 to 3 feet high with evergreen leaves and lovely violet-blue spiking flowers. It is a perennial favorite in my garden. Lavender leaves and flowers are very aromatic and can be used in herbal baths, potpourris, sleep pillows and sachet bags to protect clothes against moths. 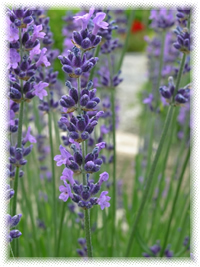 Fresh lavender makes a wonderful, aromatic bouquet, and discourages insects from invading your home. Lavender flowers can be dried, and infused in oil, and made into lavender flower water. Related Species Spike lavender, L. latifolia , contains an oil rich in cineole and camphor and is used as an insect and moth repellent.